Because the judicial system is not nearly complicated enough, there is a concept called legal fiction. In order to apply some laws, a fictitious assumption is made. For example, corporations are NOT really people because – well, they aren't, BUT per our court system, in they view of the law, they are, AND are therefore entitled to certain rights and legal protections. However, British courts trounce American courts in complexity and obsolete ritual. One of my less productive ideas was to look at the historical construction of the court system and highlight why some aspects of the judicial system are not functional (and by some, I mean lots, and by not functional, I mean less productivity and rational ability than a nap deprived toddler). 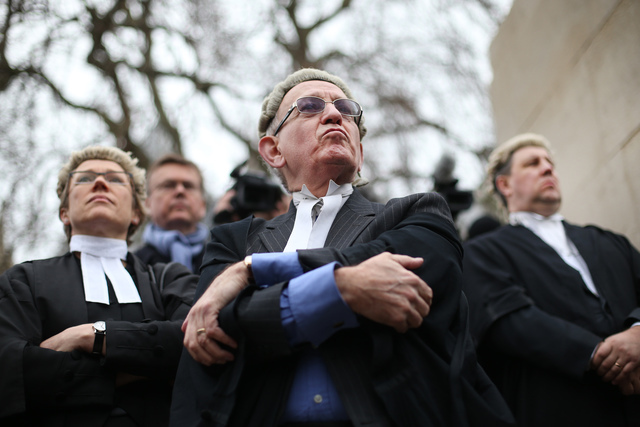 Barristers, protesting the 2012 changes to legal aid funding and lack of representation. The short answer is, the historic developmental and current juggernaut is beyond my attention span. 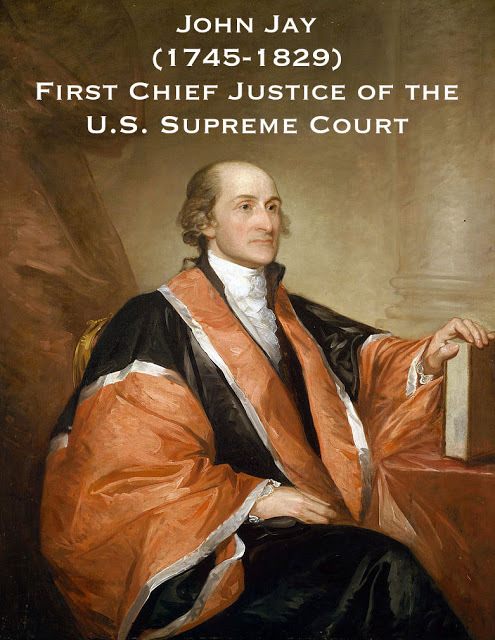 A hint at the longer answer is the contrast between acceptable Court Dress for US justices and their counterparts across the pond. 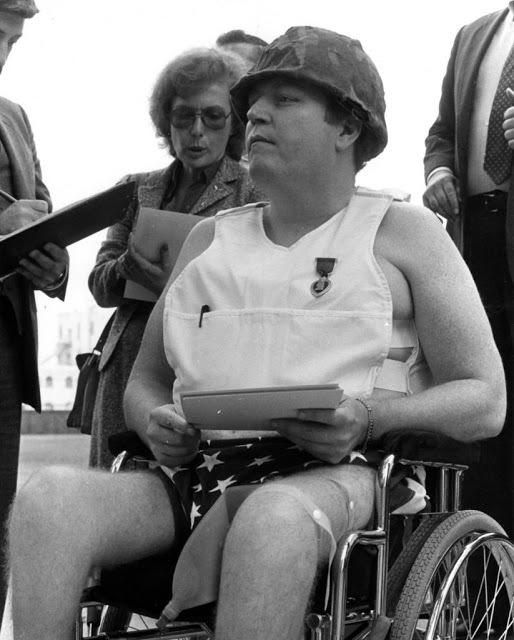 Larry Flynt, wearing an American flag as a diaper in court. He was jailed for six months for desecration of the flag. That gives some interpretationally challenged individuals a bit of leeway and some intentionally provocative individuals enough structure to rebel against. 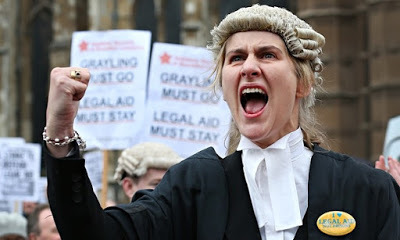 and appropriate British Court attitude? All male advocates (whether barrister or solicitor) wear a white stiff wing collar with bands (two strips of linen about 5"/13 cm by 1"/25 mm hanging down the front of the neck) . . .
and that is just the regulations for the collar. and President of the Courts of England and Wales. 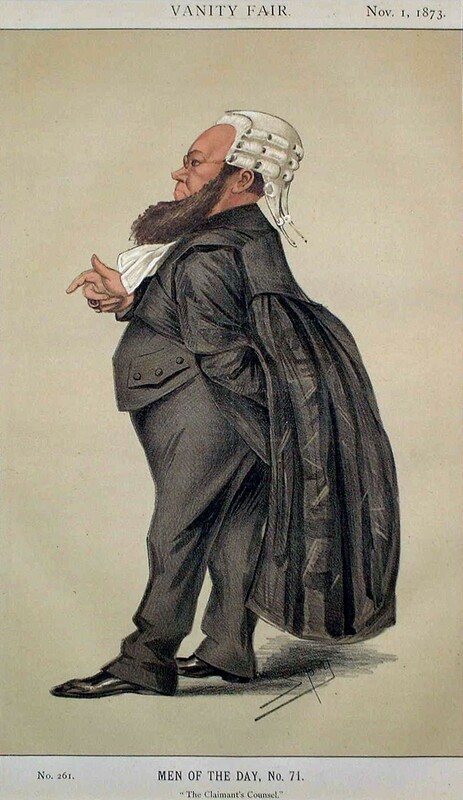 "At present High Court judges have no less than five different sets of working dress, depending on the jurisdiction in which they are sitting and the season of the year." 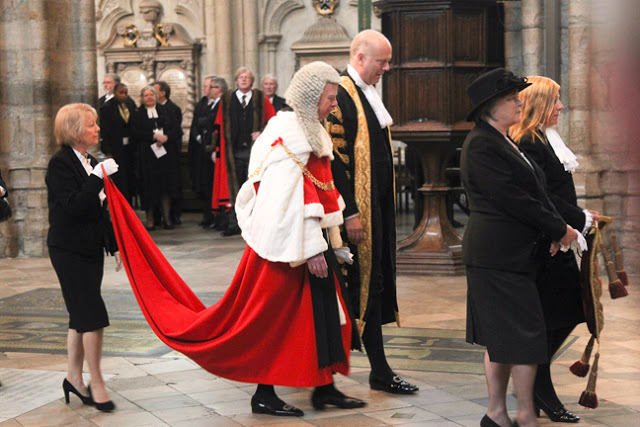 The Lord Chief Justice, when robed, dresses like a High Court Judge with the distinction of a train to his scarlet robe. On ceremonial occasions he wears the scarlet and fur hood and mantle, and a gold chain of office in the form of a Collar of Esses. Temple Bar to Westminster Abbey in Central London, 2001. A shoulder-length ceremonial wig will set the owner back £1,500 or $2,300. 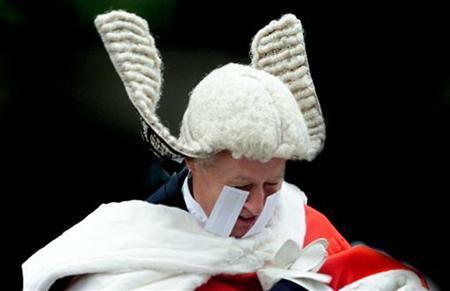 Recent changes in Court Dress would allow judicial professionals to go sans wig in civil and family court cases. A daring break from 17th century. 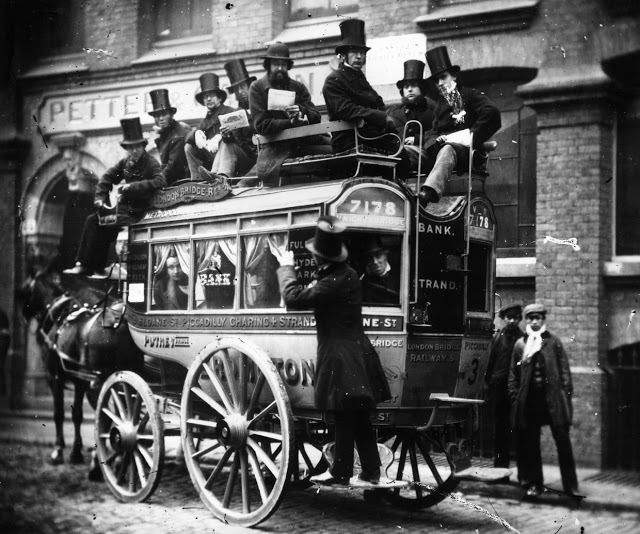 The Man on the Clapham Omnibus, similar to the US Man on the Street, a reasonably educated nondescript person of average intelligence, against whom the defendant's conduct can be measured. There are a few convoluted concepts dealing with the transfer of property including The Fertile Octogenarian, The Unborn Widow, and The Precocious Toddler. Would a moron in a hurry be fooled? The best legal fiction is A Moron In A Hurry. 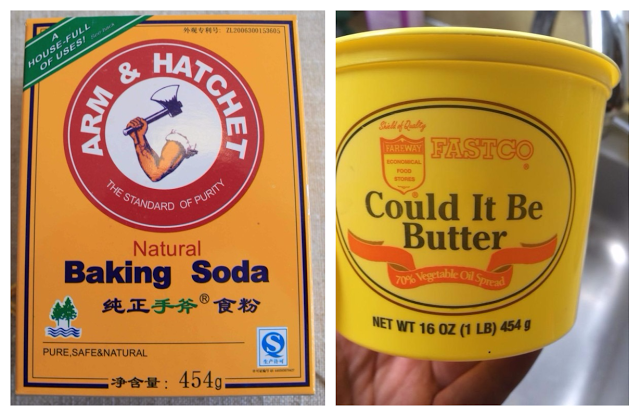 A trademark infringement can be disputed if two similar products with similar packaging could only be confused by a moron in a hurry. That is a litmus test America needs to adopt immediately! Can the instructions for medication management be followed by a moron in a hurry? Can a moron in a hurry successfully get from the airline gate to baggage claim? Can the EZ IRS form be completed correctly by a moron in a hurry? By a moron with an extensive amount of leisurely time? By a man on the Clapham Omnibus with the assistance of a fertile octogenarian? 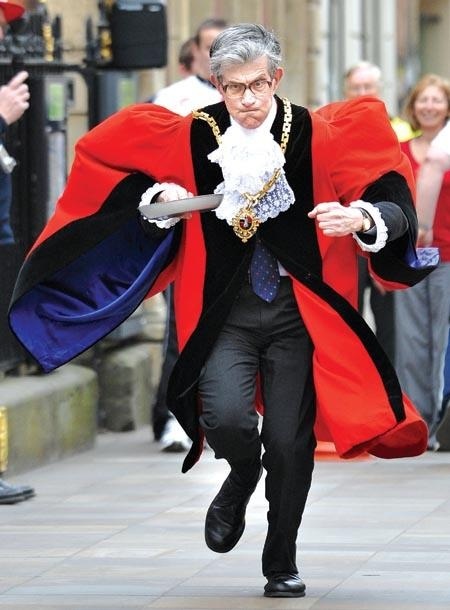 The Mayor of Worcester, in ceremonial robes and finery, participating in the annual Worcester Rotary Club Pancake Race. died in 1798, unmarried and with a fortune of £2 million (worth £200 million today). His family kept the case in court for one hundred and seventeen years, until 1915, when all the funds had been consumed by legal representation. 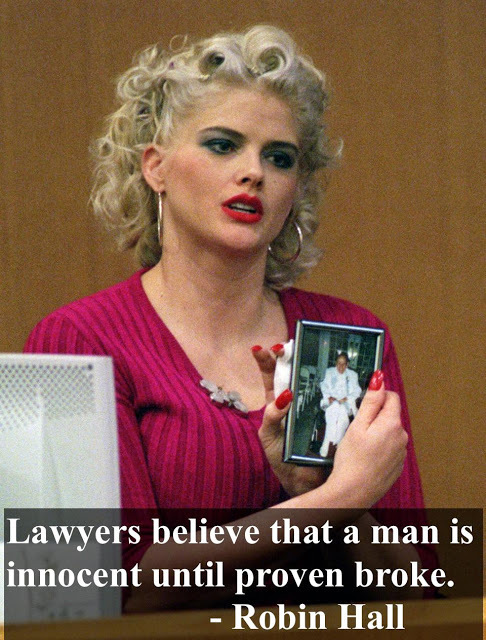 Anna Nicole Smith holding a photo of her late husband J. Howard Marshall II, while testifying in Probate Court, 2001. Impressive when considering the American legal debacle between Anna Nichole Smith and the Howard Marshall family, despite being heard twice at the US Supreme Court, and the minor issue that all direct parties have died, has only been around since 1995. Judge Judy has no time for this. Unless the American judicial steamroller manages to keep the case open until 2112, we will have to conceded to superior British legal finagling.